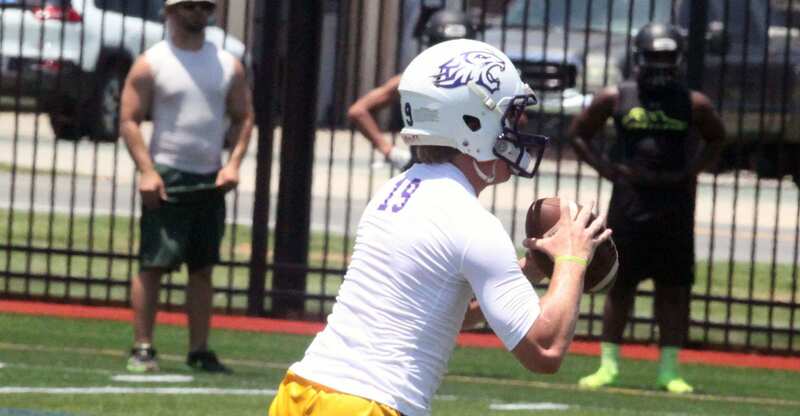 The Benton Tigers finished runner-up in the Benton 7-on-7 Football Tournament on Saturday at First Baptist Bossier’s Freedom Fields. Benton fought back through the losers’ bracket in Saturday’s double-elimination tournament after losing to Captain Shreve 16-15 in the winners’ bracket semifinals. After edging Airline 14-11 in the losers’ bracket finals, the Tigers faced Shreve again in the championship round. Shreve led 24-17 with 5:56 left when the teams were called off the field because of lightning. Not long after that, as a severe thunderstorm approached, Captain Shreve was declared the winner. The Tigers would have had to defeat the Gators twice to take the title. Benton’s Jordan Myles, a first-team All-Parish selection last season, was named the tournament’s Defensive MVP. Captain Shreve’s Cameron Davis was named Offensive MVP. Aside from the abrupt ending, Moore said the two-day, 15-team tournament went well. Moore was also pleased with the way his team played. Moore praised receivers John Westmoreland, Doyle Adams Jr. and Ian McEntee for their play throughout the tournament. He also liked what he saw from quarterback Garrett Hable, who will begin his third season as a starter this fall. Besides Myles, Moore said Cole Horton and Bubba Osby played well defensively. In 7-on-7 competition, teams get two points for every stop made. Benton defeated Pineville 49-8 and Huntington 34-23 in the winners’ bracket before falling to Shreve. The Tigers downed Parkway 25-21 and Northwood 23-22 in the losers’ bracket before facing Airline. Airline, which won its 7-on-7 event June 10, also had a very good tournament. The Vikings went 3-1 in pool play Friday. They defeated Booker T. Washington 25-21, North Caddo 25-10 and Northwood 38-2 to reach the winners’ bracket final where they were edged by Shreve 17-16. Haughton defeated Green Oaks 25-16 in the first round Saturday before falling to Shreve 25-16 in the quarterfinals. The Bucs lost to Northwood 18-17 in the losers’ bracket semifinals after winning two games. Parkway lost to Captain Shreve 19-10 in the first round. The Panthers then won three straight games in the losers’ bracket before losing to Benton. You are so welcome. We just love him. I know you are so proud of him. John Westmoreland is a great kid!! !